It’s been a while since I last posted in this blog. I have a plethora of things piled up that it became difficult for me to keep track of the things in our home sweet home. 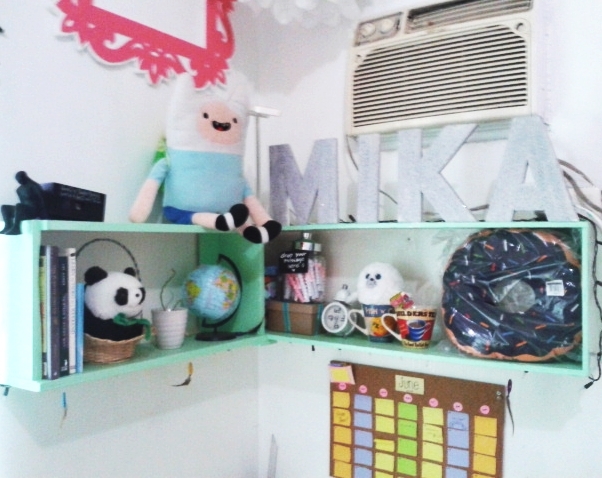 Mika’s bedroom make over was long completed but it took us a couple of months to complete everything according to her requirements. It’s not the final thing though as we have to delay some floor works until his Dad arrives. 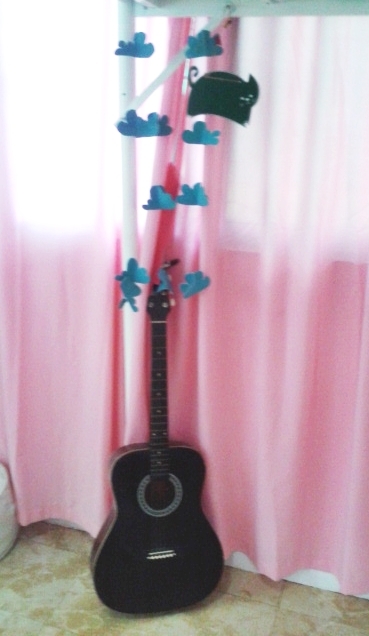 Mika was very excited to put up some decors on her room and she wants everything DIY, so as expected the progress has been really slow. She would make up one DIY project once or thrice a week, maybe that’s how teen aged girls are. It’s very different once you became a Mom, as you would always like things to be done super fast. We actually started by repainting the walls white. 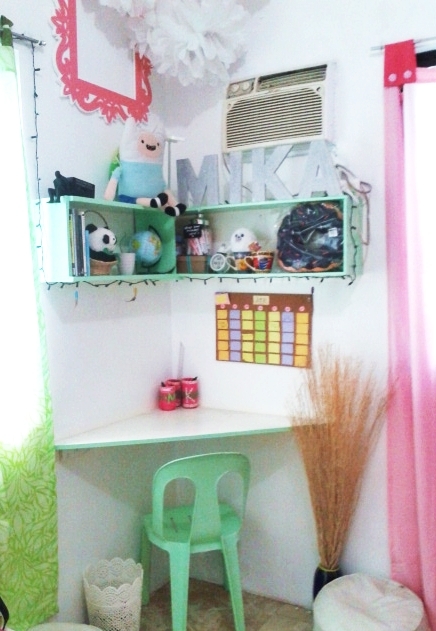 Mika loves pastel colors and she wanted mint green and baby pink to be her color accent in the room. However, we have to make use of what is already available in the house, thus her seat cushion cover became dark pink. We have plenty of excess cloth materials from a previous project and it has to be put into use. 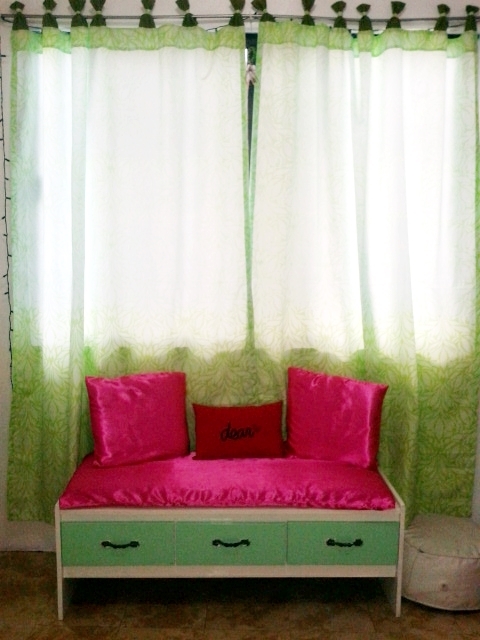 Her storage bench was painted with mint green accent though and the rest of the furniture in the room is in white and baby pink. We intentionally raised her bed so that we could make use of the space underneath to be an extra working area. She already has a concept of what will this be but we might do this on a later date. One thing good about Mika is that she is not a super spoiled brat that would ask anything according to her fancies. She would sometimes suggest recycling some furniture stuff in the house instead of buying a new one. Her wall decors and wall accent showcase her own creative and artistic side. I love the fact that she can draw and paint and she told me that she might be transferring her chosen quotes on a canvass if she already has an available time. 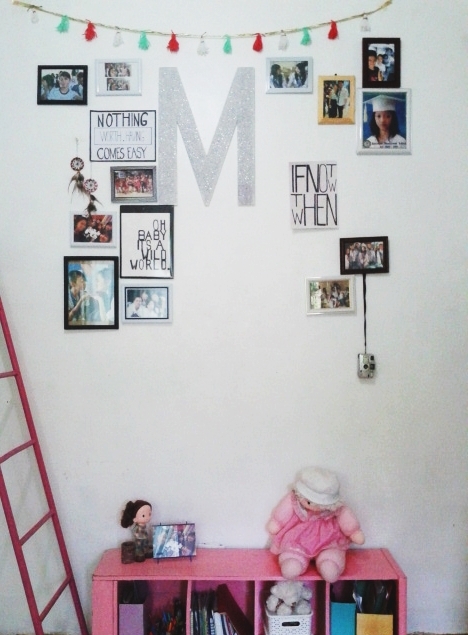 This part of the wall shows her chosen photos which is actually a compilation of all her milestones. I love the idea that she compiled photos of all the people dear to her. From her family, extended relatives down to her friends. Looking at those photos alone made me think that she has a colorful childhood and teen age life and I wish that she would have more memories to create in the future. Though this is not the final thing yet, I am happy that we are able to provide a bit of what will complete her…. her own sanctuary where she can be free and of course…happy. ganda ganda teh! nakakainspire. 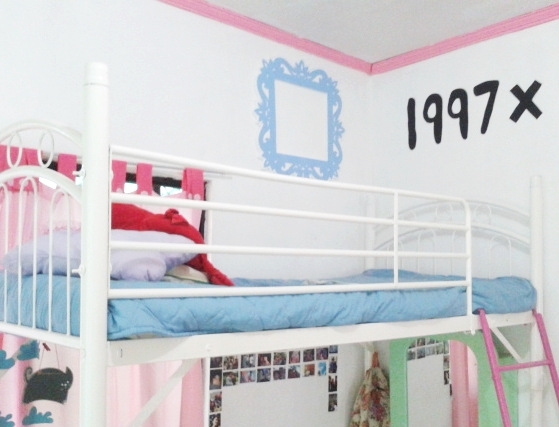 im sure Sarah would love a makeover of her room din when she becomes a lady and decorate it herself. love ko yung raised bed. nice space saver. I agree, inspiring talaga. And I love how the room looks. Ang aliwalas and fresh with the color choices. Love it! 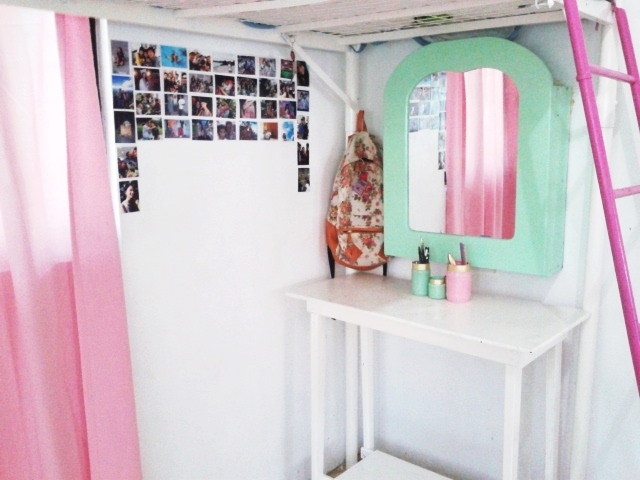 It makes me want to redecorate kaya lang no time for now. Maybe when I have the time. The idea of the elevated bed is cool!